This blast from the past is back in a big way after waiting 65 million years. 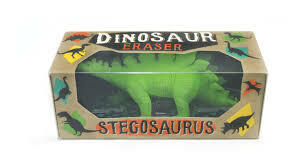 The Stegosaurus Dinosaur Eraser is the larger-than-life eraser that’s ready for your pencil made mistakes. Molded with high detail so fine that you can see textures such as wrinkled skin and facial features, the Dinosaur Eraser will be the talk of your classroom or office. And we’re talking a pretty big eraser here; 5 3/4 inches long to be exact, so you know this dino eraser isn’t going away anytime soon. Tags: eraser, party favor, school, Stegosaurus.